This morning Holly and I went back to Caffè Nero for coffee to start the day. I got the right kind of iced coffee this time and while it wasn’t perfect, it was a lot better than the last time! And the lemon poppy-seed muffin was just as good as last time. We got it for “take-away” since eating inside restaurants and café’s seems to be more expensive (but only by a few pence). I loaded my feet up with band-aids and we headed for the Tube to get to our site visit for the day. Our site visit was at The Frontline Club with American journalist, John Owen. The building that we met in was neat because it was designed to be a gathering space for journalists and photographers from all over the world to meet and have a place to work at while they were in the London area. There was lots of history in the glass cases from people that has visited the Club while they were working. Mr. Owen spoke about the differences in American and British media and then a fellow journalist, Wendell Stevenson, chimed in and before she knew it, she was part of the group and answering all of our questions with her real-life field experiences. After that, we headed back to the flats and Holly and I finished packing for Paris! We hopped on a bus that was right across the street from our flats and took that to the international train station. We picked up our tickets, checked in, went through security and border patrol (and got our 2nd passport stamp of the week!). We hung out in the waiting area for a bit and then boarded our train. There was little-to-no structure once you went through security, which was weird to me. After we walked through security, you were in one big waiting room with chairs and TV monitors displaying which train was boarding. Even once we were getting ready to physically get on the train, there was no one there to check our tickets or anything. Anyone could’ve gotten on any train and sat in any seat. We got on the train only to realize that our seats were backwards and that we would be riding backwards the whole way to Paris- very unsettling, but part of the experience, right? The pressure changes within the tunnels that the train went through were the worst part of the whole ride. My ears were popping like they never had before. As soon as I had unpopped them, they popped again. This was on and off for our entire 2-hour ride. When we finally pulled into Paris, we got off the train and realized what a crazy weekend it would be. 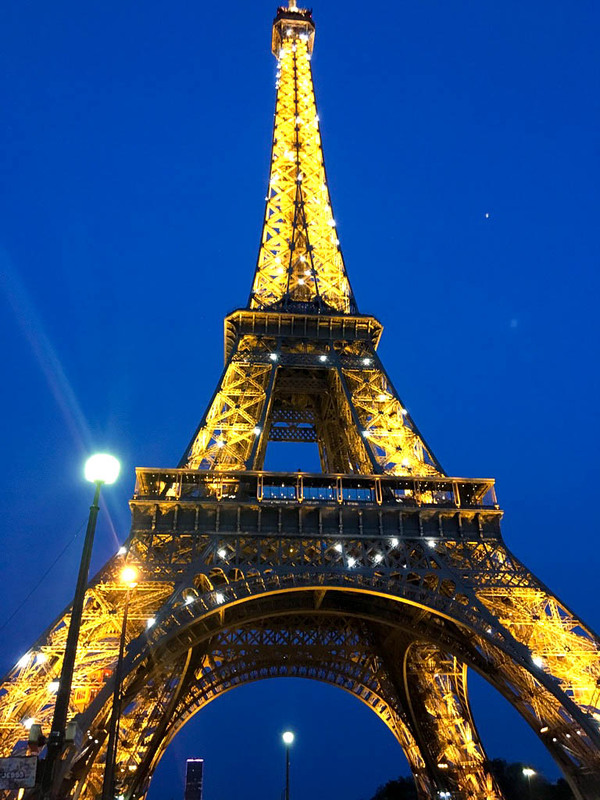 I obviously knew that they spoke French in Paris, but I didn’t really realize how difficult it truly would be to navigate through a city when we couldn’t understand what people are saying and they couldn’t understand us. Trying to find the exit of the train station was only the beginning. We were planning to take the Metro from the station to our hotel, but we couldn’t figure out which Metro we needed to be on, let alone find the Metro. So we grabbed a taxi and had him take us straight to the hotel. This ended up being a blessing in disguise because we were able to see more of the city since we were driving right through it, rather than zipping underneath it. We got to the hotel, checked in and unloaded our bags before heading to the Metro to get our tickets for the weekend. The Metro station was a 2-minute walk from our hotel, which was so nice. When we tried to buy or tickets though, the machine wouldn’t take our debit cards (which we were told they would as long as they had a chip in them) nor our pounds even though it said it accepted several different currencies. We tried to find a converter/money exchanger, but of course we had no luck. It was about 8:00pm when we left on this little adventure. Our plan was to make it to the Louvre before they closed at 9:30, then we would worry about dinner, so we needed to get a move on because we were literally racing the clock. We grabbed our second taxi of the night and headed to The Louvre. We pulled up at The Louvre at 9:15. That meant we had 15 minutes to find the entrance to the museum through the maze of walls, go through security, get tickets and find the Mona Lisa. We literally ran. Ran through the courtyard area, ran through security (after the guard told us that we needed to run faster- yikes), ran to the ticket lady who felt sorry for us and let us through without showing our IDs (tickets were free that night if you are under 26) and we ran through exhibit after exhibit to find our girl Mona. And when we got there, it was very anti-climactic. She was a lot smaller than we were expecting. In movies she looks so large and grand, but she was actually pretty small. It was actually a blessing that we were there so late, because the museum had mostly cleared out by then. We heard stories of people waiting in a mob to try and get a picture, only to have someone else in the background, but luckily, there were only about 10-15 people in the exhibit. After that, we were hurried out by security and we hailed another cab to take us to the Eiffel Tower. We got out of the car at 9:59 and the driver told us to make sure we were watching the Tower at 10pm sharp. And when we looked up at 10, it was a gorgeous light show- absolutely unbelievable! We snagged some quick pictures and then hopped in line for some crepes. Holly got Nutella and ice cream and mine was just Nutella. Nothing like dessert for dinner, right? With sticky hands, we walked back to the hotel, which was only about 20 minutes away. Today was probably the most trying day for me so far of the trip. I was beyond overwhelmed, stressed, paranoid, homesick, and even London sick. I felt so lost because I could not understand a word that people were saying, I had no idea where we were or where we needed to be, I was nervous that it was just us two college girls trying to navigate this busy city for the first time by ourselves. I was ready to hop on a train and go back right then- to London or America- I just needed to be in a more familiar area with people that knew where they were going and a language that I could understand. But that was not going to happen, so I took a shower and prayed for a better day. All in all it was a very stressful and overwhelming day. I’m missing my family, my boy and my dog a lot. But I made it to Paris!